The holiday season is upon all of us and like the last few years, our house already screams Christmas. Both trees are up with lights on, but not fully decorated yet. The Christmas Village is rockin' it's light house, fire pit, carolers, B&B, Wine Shop and more. And the rest of the boxes and totes made it up from the garage and are ready to be dug through and placed out. Half of the Christmas shopping is done and ready to be wrapped. So, basically, I'm saying bring me on some holiday spirit! I have given myself a little challenge for the blog this season to help me continue trying something new...and that challenge is to make a different kind of holiday cookie or treat each week leading up to Christmas. And then, of course, blog about it. The first weeks challenge was caramels, but not just any old home made caramels, but whiskey caramels...because what says Christmas more than Jameson?! Am I right? On second thought, don't answer that. The ingredients are simple and with the right tools, this is an easy recipe to make. My main tips are allot more time than you may think. 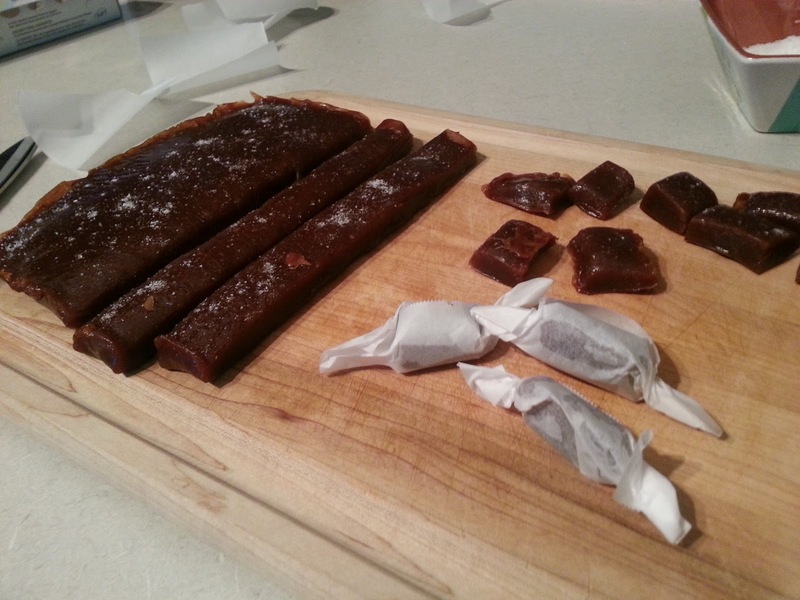 Not for making the caramel, but for letting it cool, cutting and wrapping. And trust your gut. When it gets to a nice bronze color, you know that you are doing good and go with that. 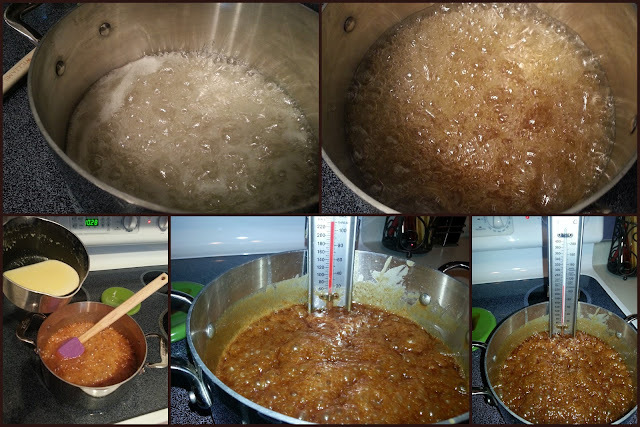 It doesn't hurt to invest in a candy thermometer for this, just to give you a read on the actual temperature. Line a 9-inch glass or aluminum pan with parchment or wax paper. Make sure the it is going up the sides so it does not stick. Melt 1 Tbls of the butter and using a pastry brush or paper towel, coat the parchment or wax paper. 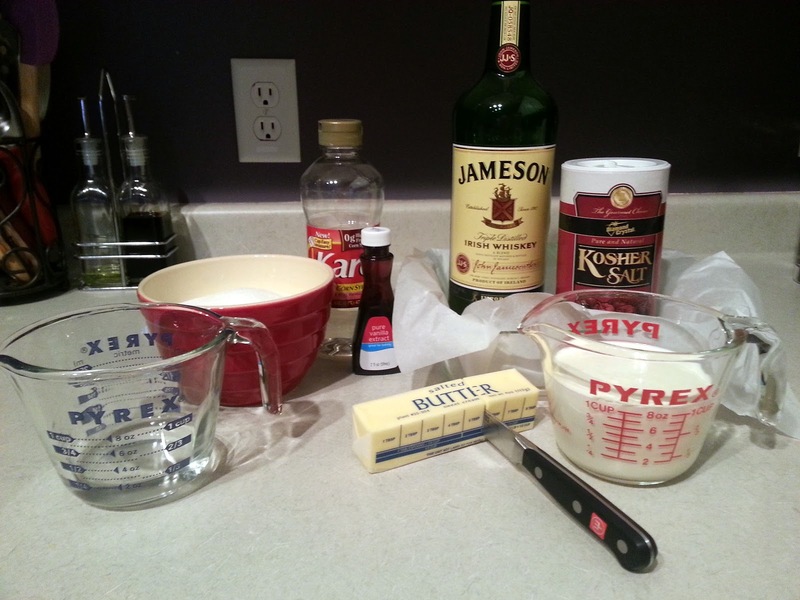 In a small saucepan, melt the remaining 5 Tbls butter with the heavy whipping cream, whiskey, vanilla & 1/4 teaspoon salt and heat till boiling. Make sure to stir frequently, it will boil up if unattended. Also, if you used salted butter, feel free to lower the amount or remove the teaspoon salt at this stage. Once boiling, remove from heat and set aside. In 3-quart saucepan, mix sugar, corn syrup and water. Heat this to boiling over medium high heat, but do not stir. That was the hardest part for me. Continue to let this bubble and boil until it has reached a warm bronze color. Take the sugar off the heat and slowly, a little at a time, add the cream mixture to the sugar mixture. This bubbles up quickly, so take your time on this part. Place it back on the burner over medium-low heat for about 10-13 minutes or until it reaches 248 degrees F (firm ball) on the candy thermometer. Pour the caramel into your prepared 9-inch pan and cool for 10 minutes. Sprinkle with the remaining 1 tsp salt and let cool completely. 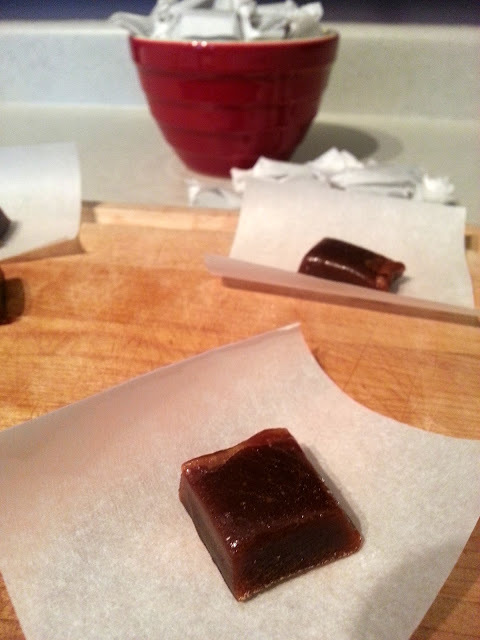 Cut caramels into small squares and wrap individually in parchment or wax paper. *Recipe from website Cookbook Recipes.